The New York Mets today announced that they recalled RHP JENRRY MEJIA from the Bisons. In addition, the Mets also selected the contract of Bisons' OF LUCAS DUDA. Both players will be available for New York's game in Atlanta on Wednesday night. Mejia, 20, made one start for the Bisons. The Mets' #1 prospect by Baseball America struck out nine in eight innings of a no-decision on Monday night against Syracuse. Mejia made New York's team out of spring training and made 30 appearances with the Mets, going 0-2 with a 3.25ERA (27.2, 10ER). Duda has played 70 games with the Bisons since his promotion from Double-A Binghamton on June 14. With the Herd, the outfielder hit .314 (83-264) with 23 doubles, two triples, 17 home runs and 53RBI. He finished 2nd on the Bisons team in home runs and RBI as well as in extra-base hits (42). 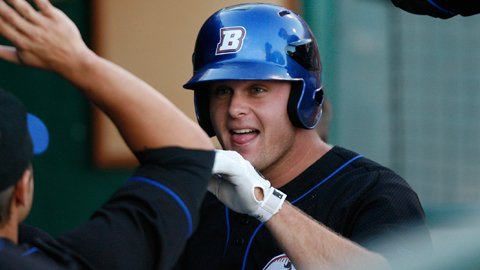 From June 28 - July 2, Duda tied a Bisons all time record by homering in five consecutive games.